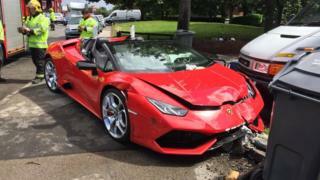 A Lamborghini was left damaged after a crash in the West Midlands, the fire service said. Fire crews from Ward End attended the scene in Garrison Lane, Birmingham, at about 13:20 BST on Monday. West Midlands Ambulance Service said a sports car was in collision with another car and then hit a lamppost. A spokesman said the 25-year-old driver hurt his nose but refused hospital treatment and was discharged at the scene.